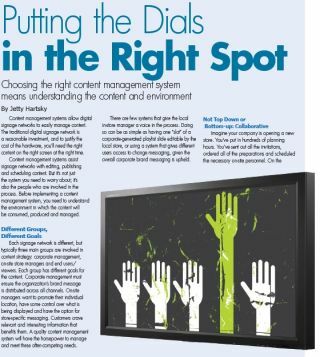 Content management systems allow digital signage networks to easily manage content. The traditional digital signage network is a reasonable investment, and to justify the cost of the hardware, you’ll need the right content on the right screen at the right time. Content management systems assist signage networks with editing, publishing and scheduling content. But it’s not just the system you need to worry about; it’s also the people who are involved in the process. Before implementing a content management system, you need to understand the environment in which the content will be consumed, produced and managed. Each signage network is different, but typically three main groups are involved in content strategy: corporate management, on-site store managers and end users/viewers. Each group has different goals for the content. Corporate management must ensure the organization’s brand message is distributed across all channels. On-site managers want to promote their individual location, have some control over what is being displayed and have the option for store-specific messaging. Customers crave relevant and interesting information that benefits them. A quality content management system will have the horsepower to manage and meet these often-competing needs. There are few systems that give the local in-store manager a voice in the process. Doing so can be as simple as having one “slot” of a corporate-generated playlist slide editable by the local store, or using a system that gives different users access to change messaging, given the overall corporate brand messaging is upheld. Imagine your company is opening a new store. You’ve put in hundreds of planning hours. You’ve sent out all the invitations, ordered all of the preparations and scheduled the necessary on-site personnel. On the day of the event, you visit the store to see the results of your hard work and realize the customers did not show up. You have plenty of sales people ready, but no one for them to assist. Throughout the day, five customers stop in. You expected to draw hundreds. You notice the salespeople were not enthusiastic about the new store and many of them did not invite their friends or family. You have overlooked a key asset: You didn’t excite or empower your store personnel to personally invest in and promote the event. Similarly, a content management solution causes frustration when it is approved by upper-level management but doesn’t meet the needs and desires of the in-store managers. A good content management system will meet the competing needs of all stakeholders to deliver quality results. Success lies in a careful calibration of a combination of people, process and technology. In the scenario above, where did the grand-opening event go wrong? The invitations were sent, and all the people were assigned to the right place. However, even if store personnel were instructed correctly, they didn’t act because they didn’t buy into the idea. There was no incentive for them to get people in the store that day. People want to know “what’s in it for me?” Your content management system must reward each group’s interests in order to gain the support of all members. Generating interest to create buy-in isn’t the only challenge when choosing and implementing the right CMS. A new CMS must be integrated into existing day-to-day business processes. People have a hard time replacing an old habit with a new one. It’s much easier to propose a variation or addition to an existing process than to bring in something entirely new. Find a system that can be worked into existing processes to increase CMS adoption rates. Many professionals are concerned about their digital signage network’s ROI. But ask yourself: How accurately can you measure ROI on a project that’s not reaching its full potential? How much greater could your ROI be if the CMS fostered high adoption rates by all store locations? Similarly, for the store manager, how much more interested would you be in the process if you had a say in what content is displayed at your specific location? When choosing a CMS system, it’s important to take a look at your organizational structure and identity the people who will be involved in the content management process. Who should have a say in what goes on a screen? Who will consume that content? What are each party’s goals for the system? Are they in conflict? It’s not enough to slap any content management system on your signage solution like a bandage and call it a day. Ask all the hard questions, carefully research all of your options—their associated features, benefits and draw backs—and elect the ideal system. Finally, enjoy the results.